You don't have to master faster-than-light travel to gaze upon galaxies far, far away. Shadowplay NYC, an independent label based in the Big Apple, has done the legwork for you. Founded by Ximena Chouza and Ali Bennaim, two "space-obsessed" Parsons graduates, Shadowplay uses its one-of-a-kind skirts, tops, and dresses to draw distant celestial bodies into a much more personal orbit: yours. 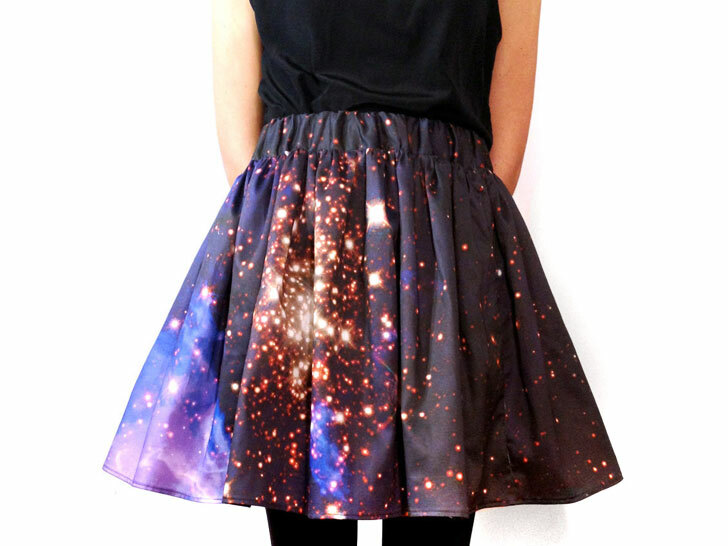 Each piece is digitally custom-printed with actual images from NASA's Hubble Space Telescope, which has captured vast networks of gas clouds and star clusters tens of thousands of light years away. Their grassroots mentality extends to their materials, which are sourced locally. 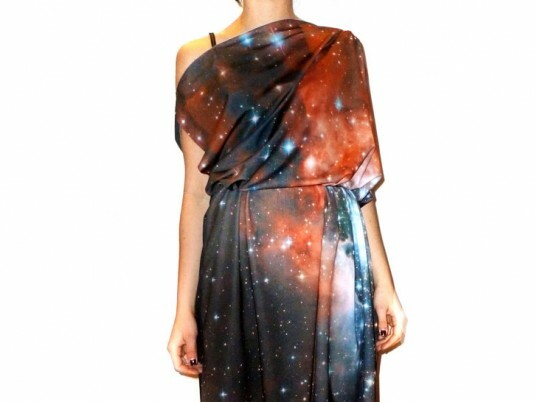 The starry-eyed pair currently hand-make each garment in their Manhattan studio, with Etsy as their primary storefront. Their grassroots mentality extends to their materials—mostly silks and cotton sateens—which are sourced locally. “As a small brand, I think it is extremely important to be fully involved in every step of the collection, from the creative process, to production, selling, and even interacting with customers,” Bennaim says. Shadowplay also employs a waste-saving drafting technique that uses up almost every inch of fabric, leaving next to nothing for the landfill. But although Chouza and Bennaim have lofty ambitions, they’ll never forget their earthly beginnings. “It is so much better to buy unique products from small designers that are produced locally and have great quality and design,” Bennaim says. What should i do to buy this dress if i live in Russia? To iolanta, You can purchase the dress by clicking on the 'Etsy' link above. It will take you to ShadowplayNYC's etsy store. Etsy is an online marketplace, there are buyers and sellers worldwide. Hope this helps, have fun! How can I buy one. Could not enter to win as we have been without power for days due to bad bad weather. Thank you. Chouza and Bennaim aren't able to pinpoint the source of their creativity, but their love of the night sky is obvious. The starry-eyed pair currently hand-make each garment in their Manhattan studio, with Etsy as their primary storefront. Their grassroots mentality extends to their materials—mostly silks and cotton sateens—which are sourced locally. “As a small brand, I think it is extremely important to be fully involved in every step of the collection, from the creative process, to production, selling, and even interacting with customers," Bennaim says. Shadowplay also employs a waste-saving drafting technique that uses up almost every inch of fabric, leaving next to nothing for the landfill. But although Chouza and Bennaim have lofty ambitions, they'll never forget their earthly beginnings. “It is so much better to buy unique products from small designers that are produced locally and have great quality and design," Bennaim says.